Imagine an opening scene where a man walks jollily through an Indiana swamp only to fall in and cry for his wife, Katherine! Katherine! She rushes out but can’t save him because she goes into labor. High drama! The film continues on its dramatic and often comedic way, as it follows the little girl born that night, Elnora, and how she grows up lovely and happy despite her mother who turned bitter because she couldn’t save her husband, most bitterly toward Elnora, whom she believes caused her husband’s death. Nothing stops our heroine–she dreams of going to college and no one seems to think that’s unusual–everyone, except her mother, of course, get busy helping her. She needed $200 and she really accomplishes her dream. Ah, plucky heroine! 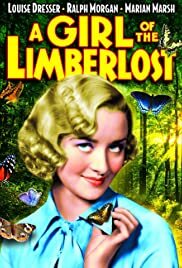 The film, A Girl of the Limberlost, is based on a 1909 novel and was made into a movie four times, once in the silent era and once in 1934, the version I watched, and again in 1945 and 1990. Since I’m a fan of the films of the 1930’s, I’ll only watch this version. The acting was top-notch as is in most 1930’s films–a background in silent films and theater makes good actors. A user review on IMDB says the film was a major hit for the studio, Monogram Pictures, making a million dollars. You can watch it free on youtube. Even though I won’t watch other film versions, I will read the novel and see Elnora’s heroism on the page. Another plucky heroine to add to the long list of Anne Shirley, Nancy Drew, Rebecca of Sunnybrook Farm, and others that’ll we’ll continue to stumble across.